First impressions can be deceptive. When Irish alt-rock trio Bell X1 released the first single from their new album ‘Arms’, a gentle, optimistic ballad called ‘The Upswing’, way back in March of this year, the song’s warm lyrical tone and organic sonic timbre seemed to refer even farther backward to the band’s 2013 album ‘Chop Chop’. Indeed, around the release of ‘Chop Chop’, Bell X1 frontman Paul Noonan had toyed with the idea of creating a pair of mini-albums, so it seemed fair to assume that ‘Arms’ might be a delayed realisation of that concept. However, the second single from ‘Arms’, a quirky and upbeat number called ‘Out of Love’, immediately turned that idea on its metaphorical head. Laden with strident synths and jarring percussion, the song is musically more experimental and thematically much more cynical, with lyrics like “there’s no D minor telling us how to feel” only adding to the contextual confusion. And as an introduction to the album proper, opening track ‘Fail Again, Fail Better’ makes a deliberately disarming (pun intended) initial statement, with choppy lyrics and fragmented melodies spliced together seemingly without pattern or purpose. But like the very first glimpse of the album, these second and third impressions of ‘Arms’ are gradually revealed to be a bit misleading as well. The true character of ‘Arms’ is elusive, fluctuating constantly over the course of its tracklisting. Even the individual songs feel indecisive at times, as in ‘Bring Me a Fire King’. The song’s catchy chorus and groovy guitar riff are thrown off kilter by a piercing synth line and an oddly placed sax solo, and Noonan delivers his sarcastic political commentary (“let’s ask what the markets would do / ‘cos markets have feelings too”) in a mild vocal tone that belies the depth of his meaning. On the flip side of the thematic coin, multi-instrumentalist David Geraghty contributes something of a more personal nature in ‘I Go Where You Go’. His quiet reflection on life away from home is brightened by a shuffling rhythm and a piano melody that shines through the arrangement like the “glint of fool’s gold” in his own opening lines. Nestled between verses, the song’s bridge section cuts to the heart of Geraghty’s internal conflict: “the engines roar / the ground slips away / our children stir in their beds / we leave it all in our wake”. On every previous Bell X1 album, there has been one song in particular that is so exquisitely poignant that it moves me to tears. ‘Arms’ is no exception to that precedent, ticking off the box with ‘Take Your Sweet Time’. Inspired by a video of a profoundly deaf woman hearing speech for the first time, Noonan has composed an incredibly sensitive musical interpretation, with distortions in the sonic arrangement representing the synthetic quality of electric hearing via cochlear implants, while a lyrical and melodic reference to classic Glen Campbell track ‘Wichita Lineman’ suggests the breathless emotional anticipation of eventually being able to hear music. Have a handkerchief handy when you listen to this one. Late album tracks ‘Sons & Daughters’ and ‘Fake Memory’ return to a central thematic concern about Western culture and society, observed from a slight distance and framed within the familiarity of personal details. Noonan offers a kind of pre-emptive apology in ‘Sons & Daughters’, which situates his oddly astute pop-culture references (“there were too many distractions and too much good TV . . . there were too many cute pictures and too much in my feed”) in a call-and-response vocal pattern over a bright piano melody and tribal percussion. Recent single ‘Fake Memory’ reflects on our disingenuous tendency to use social media to portray ourselves in a positive light, asking pointedly “where’s me asleep on the table or her not kissing me back?” and warning that “if memory serves you badly, it’s right here on my phone”. The title ‘Arms’ initially evoked the idea of emotional distance in my mind, especially after hearing the first several songs released discretely and out of context. But several considered listens to the album in its entirety brought me back around to Noonan’s observation from its press release: “As the world feels like it’s becoming a harsher place (maybe there’s just more damn noise? ), we seek out the comfort of the familiar and familial . . . arms.” The album’s dual nature is about more than just the band experimenting with their own musical style. There are moments of noise and moments of comfort here, moments of awkward confusion and moments of crystalline clarity, but above all else, an always astonishing sense of musical and emotional authenticity. 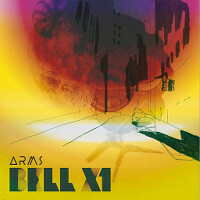 Bell X1’s seventh studio album ‘Arms’ is available now via BellyUp Records. The Irish trio have a series of Irish and Northern Irish dates at the end of October into early November. They are also scheduled to play two shows at London’s Islington Assembly Hall on the 11th and 12th of November before heading down under for a tour of Australia in December. A full listing of Bell X1’s upcoming live shows can be found on their official Facebook.